We enjoyed a rare treat this weekend: we got both of our college sons, my father-in-law, and my husband and I together for dinner! We met at a restaurant in our sons' college town. 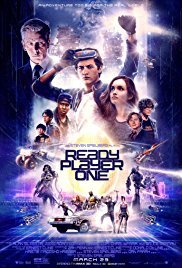 After dinner, my husband, our older son, and I walked to the movie theater (our favorite recliner theater) to see the much-anticipated Ready Player One. The three of us all read the novel (my review at the link) when it first came out, passing the book around the house with "you have to read this!" so we have all been excited to finally see the movie adaptation. Of course, the book is always better, but all three of us thoroughly enjoyed the movie. Tye Sheridan plays Wade, a seventeen-year old boy in 2045 who lives in "the stacks," a huge trailer park outside of Columbus, OH, with beaten-up trailers literally stacked up on top of each other (we're not sure why they added one year to the date or changed the location from Oklahoma for the movie - that's Hollywood, right?). In this near-future world, life has become so challenging that people spend most of their time in the OASIS, an online virtual world created by multi-millionaire programmer James Halliday. When Halliday died, he hid an Easter egg (a secret hidden in a video game) in OASIS, accessible only with three hidden keys. Whoever finds the egg first will inherit not only Halliday's wealth but also his ownership of the OASIS. It's been five years since Halliday's death, and no one has found even the first key yet. Some people have lost interest, but Wade, or Parzival as his avatar is called in the OASIS, is still looking. It's common knowledge that Halliday was obsessed with 80's pop culture, from his own youth, so Wade has become an expert not only on Halliday's history but also 80's music, movies, TV shows, and video games. His best friends in OASIS (whom he's never met in person) are Art3mis, played by Olivia Cooke, and Aech, played by Lena Waithe of Master of None fame. The three of them, along with a couple of other friends, work together after Parzival finds the first key and eventually meet in the real world. Of course, there are bad guys here to fight against - an evil corporation that wants to control OASIS so they can add advertising and monetize it. This is a fun, rollercoaster ride of a virtual adventure! Watching it unfold on the big screen was a very different experience than reading the book but just as captivating. Here, many of the 80's pop culture references are visual and auditory, so you have to watch and listen carefully (I think I would probably pick up on a lot more references watching it a second time), but it has that same fun feel to it, with a mix of retro and futuristic. The scene that takes place within the world of The Shining was one of our favorites! Although half (or more) of the story takes place in virtual reality, you don't have to be a video game fiend to enjoy it - it's just a suspenseful mystery adventure in a different kind of visual environment. Of course, we liked the book better (isn't that almost always the case? ), but all three of us thoroughly enjoyed the movie and left the theater with big smiles on our faces. I am ready. Must talk my husband into it, though. He never read the book so isn't as interested as I am. From the reviews I have read and heard, those who haven;t read the book are enjoying the movie, too! Hope you get to go see it soon - this is definitely one to see on the big screen!